"Can you prevent your ends from splitting?" With this question I'm just going to jump right in. The answer, unfortunately, to this question is no. You can not prevent your ends from splitting. You can, however, prolong them from splitting so fast. You can do this by wrapping your hair every single night. When you do not wrap your hair, whatever you lay on, whether it be a bed, couch, floor, etc causes friction every time your hair rubs up against it. This friction makes the ends split faster. If your hair gets wrapped up on a daily/nightly basis then it does not have the friction created from rubbing up against something which means you can go a bit longer without trimming. Isn't that great news? If you wear your hair in its natural state and wrapping is not an option for you, then you can at least get a satin pillowcase or a satin bonnet. 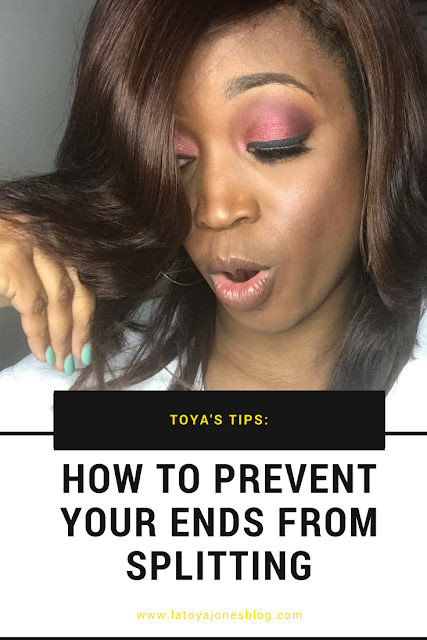 These things are highly effective in preserving your ends. Be sure to join me next time for Toya's Tips!